Are you fed up by going to mobile recharge shop to recharge your phone? Here is a best solution for you. 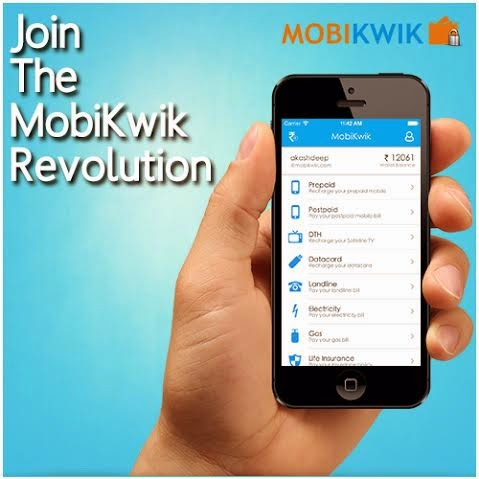 MOBIKWIK is a very simple and secure way to recharge your phone, data cards, bills and lot more. A very user friendly graphical user interface of the application makes it best and easier to use among all other application in the market. MOBIKWIK's concept of MOBIKWIK WALLET adds more value in it. You can create a wallet by simply providing your EMAIL, PASSWORD, MOBILE NUMBER. Adding money in wallet is easy and saves time in future transactions. Simply fill mobile number , carrier provider and pay using wallet( that too in seconds, sounds interesting ?). Here is a list of how Mobikwik has made life easier. I need not to go to mobile recharge shops any more, just simply browse www.mobikwik.com , choose your plan, carrier provider and recharge in fraction of minute. I can recharge my data card like Idea netsetter, MTS Mblaze and Tata Photon directly from my home resulting in saving my time. Add money in the wallet use it anytime whenever you are running sort of balances. I can recharge my phone using SMS, to do so just add money in the wallet and recharge using SMS from anywhere. Mobikwik is also available on WINDOWS OS, Android, and iphone to recharge your phone from your phone. To download the app click here . Mobikwik also provides facilities to recharge your DTH like Airtel DTH, Dish TV, Sun Direct, Tata Sky, Videocon D2H and Reliance Big TV DTH. Mobikwik is safe and secure services providing data integrity for your personal information. Mobikwik provides easy and multiple modes of payment like credit cards, debit cards, net banking for almost all the major banks, cash cards. I recommend all the smart phone or internet users to simply download this application which saves time, provides safe and secure data card, mobile recharge, and bill payment facility.